Enchanting is one of 6 professions in Elder Scrolls Online. It allows player to improve armor, weapons and jewelry by adding new effects. An Enchanter does not modify items directly; instead, he creates glyphs that can be applied to items. This profession will help you to modify your own items and earn gold selling rare glyphs to other players. As any other crafting profession Enchanting has dedicated skill line but unlike most of other professions it consists of 5 passive abilities (Blacksmithing for example has 6 passives) and you will have to spend 20 skill points to master all the skills. Aspect Improvement (1/4) Allows the use of [Aspect rune type] to create Glyphs of X quality. Potency Improvement (1/9) Allows the use of [Potency rune types] to make Glyphs of Level X - Y. Keen Eye: Rune Stones (0/3) Runes in the world will be easier to see within 20/30/40 meters. Hireling (0/3) A hireling will send you runes every day. These abilities will help you to progress in this profession. The most important passives are Aspect Improvement and Potency Improvement because you will not be able to progress in Enchanting without mastering these abilities. You can create Glyphs from runes that can be found throughout the whole continent. 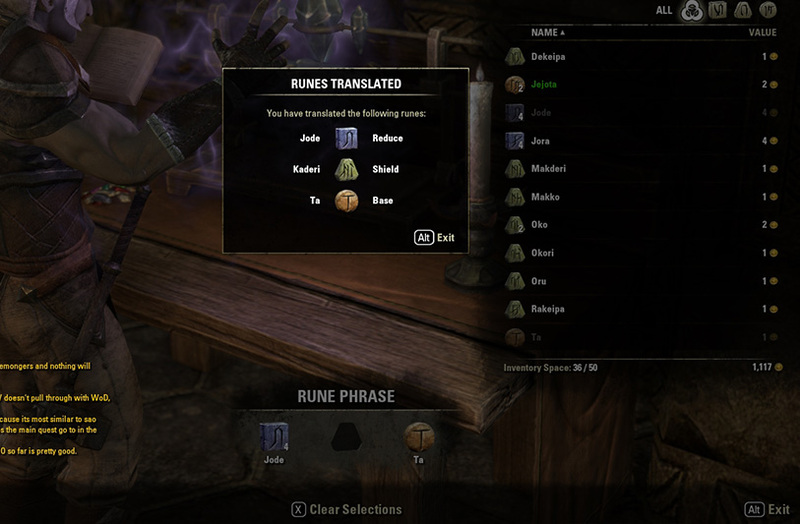 There are three types of runes in ESO: Potency Runes, Essence Runes and Aspect Runes. You need at least 1 rune from each group to create a Glyph. That’s why the process of gathering is very important – you need to gather as many runes as you can. Potency Runes are the first type of runes you will need. They have a square shape, are easy to recognize and you can gather them from blue gathering nodes. Potency Runes are important as they determine the level you must to be to use the glyph. Potency Runes can be either additive or subtractive. Additive can boost, increase, gain or add something. Subtractive can decrease, lower, reduce, weaken or subtract something. For example, additive Potency Rune combined with other runes will provide you with a glyph that adds x Frost damage to weapon while the subtractive one will give you glyph that adds Resistance to frost. Essence Runes can be gathered from yellow nodes and can be recognized in the inventory by their trapezoid shape. While Potency Runes determine the action (add or subtract) Essence Runes determine subject - the attribute or stat that the enchant affects. Tip: Aspect Runes are rare and are much more difficult to find than other runes. You should never miss red gathering nodes. If you are not enchanter you can gather Aspect Runes for selling. They have rather high price. Right now there are three major categories of Glyphs in ESO: armor, weapon and jewelry. For example Armor Glyph can be applied to pieces of armor only. You can’t enchant your weapon with armor glyph. There are three types of Armor Glyphs – for increasing health, magicka or stamina. You can increase one of you core attributes with these armor glyphs. There is one thing you should know: different armor pieces have different enchanting slots. The difference is: when you enchant a piece of armor with a normal slot you receive the full effect of the glyph you used. When you enchant an item with small slot the effect will be lowered and you will receive about 40% – 50% of the promised effect. For example you have an armor glyph that increases magicka by 100. If you enchant an item with normal slot you will get +100 magicka bonus. If you enchant an item with small slot you will get +50 magicka. Don’t forget about this! You need to find an Enchanter’s Station in order to start crafting. These can be found in all the major cities throughout ESO. As any other crafting station the Enchanter’s table can be used by many players simultaneously. You can do this by combining different runes and trying to create something. If your attempt is successful you will create a glyph and discover new traits (effects) for particular runes. This process is very interesting and challenging and depends on the luck. After you have created a Glyph you may apply it to an item. Simply go to your inventory, Right Click on the item you want to enchant and choose “Enchant” from the dropdown menu. You will see a special window where you can choose your glyph and apply it (the glyph must be in your inventory). Once the process is finished you will get a new effect on your item. The glyph you used will disappear. 1 glyph = 1 enchantment. Don’t forget that each item has only 1 slot for enchanting in ESO. If you apply another enchantment, the previous one will disappear. Enchanters can not only create Glyphs but also extract runes from glyphs. All you need for this is to have a glyph in the inventory. Extraction will not only provide you with extra runes but also will give you some experience in Enchanting. You will loot many different runes from your enemies and it is a very good source of glyphs. Selling glyphs is a rather good way to make money. Low level glyphs (enchants) are not very popular and it’s difficult to earn money from low level glyphs. But you can sell high level glyphs at a high price. Players are looking for high level enchants for their gear. High level enchants of the best quality can make any gear much better. Don’t forget that the price of a glyph depends on the quality. The higher the quality is the more money you can earn. Whats «INTRICATE» trait on weapons and armor for? Hi Eddie, the Trait called 'Intricate' increases the amount of inspiration gained from an item (by a particular listed percentage) when it is recycled at the appropriate related crafting station by using the deconstruct tab. For example you may get an in-game item such as the 'Sugar Jacket' that has the Trait called Intricate on it. Let's say this is a Level 4 item and has great enchantments and armor rating for that level, but later you outgrow it and want something more powerful. Well, because it has the Intricate Trait on it, you could get more inspiration by deconstructing the Sugar Jacket, than you might from an item without the Intricate Trait. If however you had a sword with the Trait called Intricate on it you could deconstruct it at the Smithing crafting station, and so on — that's what I mean by using the crafting station appropriate to the item. Another way to recycle items that you have outgrown by leveling up, is to use the Research Tab at the appropriate crafting station for that item type, and extracting the Trait from it, so that you can apply that particular Trait to another item of that type that you craft when you are ready to. When you recycle items by Deconstructing them you will get some some materials back from them; and sometimes also some improvement items such as gems, stones, or hemming etc. depending on the item type, inspiration and luck. However, when you recycle items by Researching them, you will have their Trait extracted from them and added to your list of researched Traits that you can pick from to put on the new items you make. When you either Deconstruct or Research an item this way, it does destroy the original item, but you get something back from it that helps you create new items. I hope that helps. If you have any more questions, feel free to ask.